[NEWS]Please welcome our newest Reporter! ROCKO! Rocko has accepted the position as Napa Valley Reporter! Please give him a great big Napa Valley welcome! Comments Off on [NEWS]Please welcome our newest Reporter! Here are the numbers for Baja. To see the original post from UO Herald click here. This interview kicks off, what I hope to be, a series of interviews of Baja’s wonderful and creative residents and a tour of their home. If there is someone that you would like to see interviewed please send me a PM. 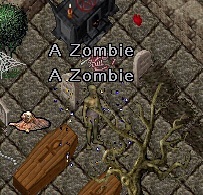 A Zombie is one of those people who make this game just so much more interesting and tries to make this game fun for others. Below is a brief interview with Zombie. I hope you enjoy it. 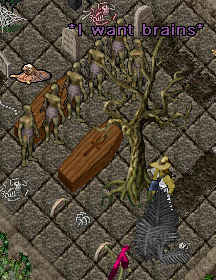 What was the inspiration for the zombie Mausoleum? You’re charging a one brain fee to enter. Do you have visitors that actually donate a brain? I find that rather odd. Funny thing is, there are about 20 brains in the box. And odd is my middle name. Wesley Odd Zombie the 3rd. Why do you have exhibits on the Town Guards and the Girl Scouts? To prove to all the other zombie wannabes out there that I am one bad mutha….. I chose the Town Guards because they are my sworn mortal enemies, and I wanted to make an example of what happens to those who dare try to thwart the zombie. And I chose the EVIL girl scouts out of begrudging respect. Compared to them I am like the bud light of evil. There is also the added bonus of managing to creep out our last two EM’s. That in itself is worth the effort. How did you become a zombie? Do you have a girlfriend? 2nd part No… 2 words … Dry Rot. I did have a special she zombie friend a while back. But she claimed I only loved her for her brain so it didn’t last. OK so how I became a zombie … I was alive once, a simple farm hand to a family of nobles. I fell in love with the beautiful daughter, Buttercup, but I had no means to support her. So off I went to make my fortune. I fell in as an errand boy to a somewhat incompetent necromancer. This was a huge mistake, becoming an apprentice to someone who calls himself “The Slug” simply can’t end well. After an unfortunate accident involving demon blood, nightshade, blackrock, mongbat testicles and a cauldron, I woke up feeling kinda funny. As time passed I realized that my flesh was decaying, I stank horribly and I had developed a real taste for living brains. I had also been freed from the mortal views of “virtue” and good and evil. To make a long story even longer, I returned to my family of nobles, and of course, ate their brains. I offered Buttercup the chance for immortality, but she declined, citing the fact that immortality was far too malodorous for her liking. I left her alone, since her brain would not have made even a decent midnight snack. I then built myself a mausoleum and starting slinking around Britain, thinking that there might might be a few decent sized brains left there . Has the way you play the game changed since you first started playing UO? If so, why and how? Kinda OOC but I’ll answer anyway. I’ve been around since ’97 (beta actually) off and on. The game has evolved, obviously, and so have I. I have gone from being a wide eyed newbie myself (back when you you couldn’t set skills, there were no guilds and spellbooks weren’t even blessed) to pking newbies in chicken form, ( I had a mage named “a chicken” for a while) Then I got involved in an anti-pk guild (simply called the Knights, then Elder Knights, then Great Horny Toads) The Great Horny Toads still exist today, but only 4 or 5 real people left and I have no desire to re-grow the guild. I attempted (key word being attempted) PvP up until about the time of Samurai Empire, when things got too complicated for me. Since then a few large guilds, UG.K, AFK/UTB 2 stints in [email protected] and M!S for a short time. (I am in the Town Guards now) But the drama and rules of being in a large alliance got to me so since then I have been more or less on my own with a small group of trusted friends. Who do you hang with ingame now? Or should I be asking.. who hangs out with zombies ingame? Hey that’s not nice !! *hmph* I even took a bath about 100 or so years ago! Who are some of the people that inspire you ingame? Anyone who does their own thing and goes their own way really. Corporal Brackus is a major role model, I have nothing but respect for the way he plays this game. Handalf, of course. Mama Faith, Jocasta, Al, you Amber, Sally the Pie Girl, and many more that I have either forgotten or just too lazy to list. What do you enjoy doing ingame? Just relaxing and having fun. EM events are always fun, and doing pretty much anything with my alliance mates, or other like minded people . I’m not a PvPer, RPer or anything else. I’m simply me, that’s all. Anything else I should be asking that I’ve forgotten or that you would like to say? *moans * *spits* *squish* *flaps* OK I think I about covered it. After reviewing the evidence and notes of my detectives, I believe I know who stole the stockpiled cures from the Ter Mur fishing village. It is time to confront those responsible, and retrieve the medicine – by force, if necessary. Please meet me at my office in Serpent’s Hold. I shall provide a moongate next to the Emissary’s Hall in Britain. This will conclude the mini-arc that ties into the larger events involving the curing of the gargoyles in Ter Mur. When I was reporting the last time around I used to do a series of interviews of characters around LA and the UO Community that I called “Twenty Questions.” This time around when I asked myself who to start to interview I kept bogging down until finally I realized that what I’d really like to do is interview everyone – particularly since I never got around to everyone last time and wished I had! To make this easier and more immediate I would simply like to put out this list of questions and ask all of you to fill it out and send it back to me in messaging or email! I will post at least one reply a week, if I get them, that will include any followup questions I feel are needed or that include any other questions you feel need to be added (within reason of course 😉 ). There is no way for me to get to know everyone or run into all the LA players around the world. However, there is no LA player that isn’t vitally important to all of us as a group and as a community as well. Help us all to get to know you and your friends and participate in our shard and forum community! I would love the help in giving us the pleasure of getting to know the Community, and you, better! Here are the questions I’ve come up with. There are 22 of them in total, but respondents do not need to answer any of them that they do not wish to! If you think I left something out, please feel free to add it in! What is your main character name and what profession does this character follow? What is your favorite character profile template to use? Why? How did you get into playing UO and how long have you played the game? Do you own a house and would you like to say anything about it? Do you prefer group play or do you do a lot of solo gameplay? Do you play as a guild member? If so, would you like to tell us which one and ‘plug’ it? Do you participate in faction play? If so, would you like to share which affiliation you play? Do you have a vendor house or placement you’d like to ‘plug’? What do you think is the best thing about UO that keeps you coming back for more? Are there any ‘sweet spots’ in the world of Sosaria that you think are particularly cool and a favorite place of yours to be? There are lots of different types of deco and special armor that have been presented as prizes and gifts over the years. Do you have a favorite that you particularly enjoy or a type of gift that you particularly enjoy? Do you attend in-game events by players or the EM? If so, what do you like about them? Do you or have you played other MMOG’s? Do you play them at the same time you play UO? What do you think of the housing architecture program in UO? Do you often redesign your house? If so, what is your favorite style design? What do you think of UO as a social media tool? Do you use it as such? Do you play using any other social media tools like ICQ, Skype or another IM/Video program alongside it? Do you listen to the in-game music? Do you control it using the deco tool “Dawn’s Music Box” or just let it play as it will? What would you like to say about the game personally that I haven’t asked about? Any last words for us?